- You'll have 65% chance to learn it when picking up the crystal of a unit who knew the spell. Black Knight was here..... IN AMERICA!!! Please , i have two small questions. 1-Does the ??? status multiplicates every unit status by 10? 2-Can FFpatcher edit the job level of any job for any unit on ENDT?If yes ,how? -Wait a minute, did you just summon a bunch of monsters in one turn? -That is against the rules isn't it? -Screw the rules I have money!! Ok , thank you very much xifanie. Another question please, how many types of sprites can i have in a battlefield at once? I am asking this because i saw in a post that in order to give lavian ,alicia and rad new special jobs you will have to change fukes the chemist to an archer, otherwise the battle would not start. Is there any other battlefield that have this limitation? no limit for the types (TYPE1, TYPE2, MON, CYOKO, KANZEN, etc. ), but you can only have 9 spritesheets loaded in the game at any given time. Being over the limit would only cause graphical glitches though, it would not prevent the battle from starting. Thank you again xifanie, you have no idea of how much you are helping me out. How can I make an attack to go from person to person? I remember seeing a fire attack that would "spread" to clumped together people. Is there a way to do it with just fftpatcher? 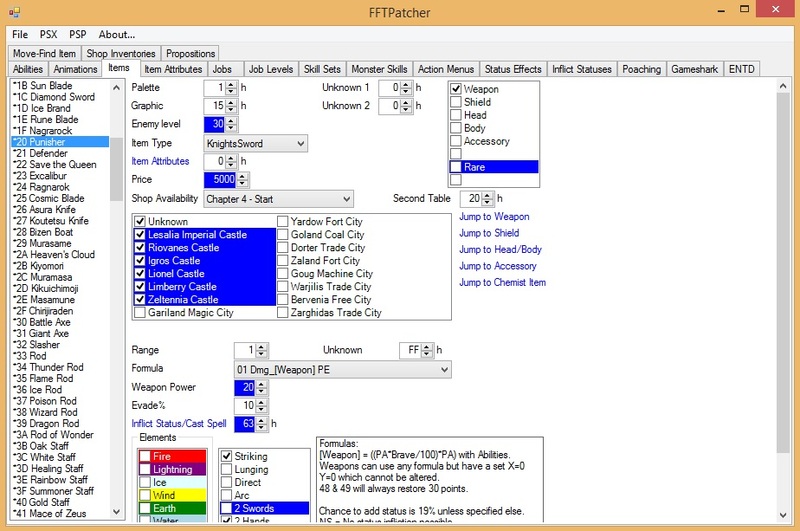 If I want a spell to go in three lines away from the caster, like triple chain lightening, what would I check off in fftpatcher? (ai behavior) Linear attack. triple breath ; (bottom box) vertical fixed, linear attack, 3 directions. I haven't tested it yet but that is what I set the spell to have. Also, is there a formula that does damage and guarantees a status effect? You will have to mark 3 directions , linear attack and adjust the area of effect .Also , i have a question, when i change an ability to "weapon strike" it does not "weapon strike" in game , am I missing somenthing? I want to make some items available in the shops. I can do it with the normal items, but I want to add the extra rare ones, like the chaosbringer. It doesn't give me the option to do that. What can I do? Check off the towns that you want it to be sold in. My problem is on the PSP version of the game. I want to add the items on the left side, but it doesn't show me the cities or shops. Here is want I mean. The PSP exclusive items were crudely tacked on in a completely separate item databank that was never made available to anything the Patcher can affect. All you can do with them is change their stats, names, and descriptions. Saying that WotL is mod-unfriendly compared to the PSX version is, frankly, putting it lightly. 1. The turn window cannot be displayed because the desired effect is too far in the future. 2. Nothing happens, but it counts as an attack attempted. 3. If the battle goes on long enough, the game crashes. The answer may very well be "Don't try to mod WotL", but I've been able to do everything else I've tried except this, so I think it may just be my inexperience. What am I doing wrong? I think I may have found an answer to both of my questions. 1. It kept crashing because I had corrupted the ISO with an earlier version. I will be starting over tomorrow with a clean ISO. 2. Eye Gouge is the ability that I need to copy. It uses formula 50: "Hit(MA+X)% Status PE". Hello, wanted to thank the contributors here, long time user of some of the tools here for the original FFT. Now I'm moving onto PSP stuff. My issue is that if I apply the slowdown patch + the patch I created with the editor, the game will crash when Delita in the first battle takes a turn (haven't tested elsewhere). I've used a fresh game and tried both patches separately and they will definitely work alone, just not together. Any ideas? 3. THEN apply the slowdown PPF.